Last week, Lily shared her book pick with us. This week it’s Emmy’s turn! Her book pick is named Sweet Dreams and Bedtime Blessings. It’s just a little book that someone gave us when one of the girls was a baby. Both of them loved this book, and Emmy’s little talk will tell you why. Emmy doesn’t like the blog name I choose for her, so she has decided to be “Ariel” for these book picks. That’s not her real name, either. 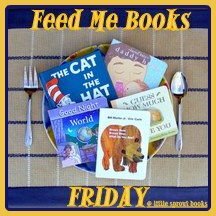 For more great children book picks, visit Little Sprout Books by clicking the button below! Awww…she did such a nice job sharing that book! She is such a cutie, not an Ariel fan by chance is she?? Too funny she wanted to change her blog name! Visiting from Little Sprout Books….I love the way you show your book pick by posting a video of your little one. My son really likes the flap books and now that he's 2-1/2 he actually reads them without tearing the flaps off!